Despite the claims of many air purifier manufacturers, there are very few air purifiers on the market today that can do a significant job of killing bacteria and viruses or filtering them from the air. The fact is that most bacteria and viruses are too small to be effectively trapped in HEPA filters, and they readily escape from electrostatic and ionic filters. However, there are a few newer technologies that have indeed proven quite effective against bacteria, viruses and other microbiological (living) contaminants; most notably ultraviolet (UV) light, and incineration. UV light sterilizers are typically added to high-end HEPA filters to extend their capabilities to remove / kill bacteria and viruses. A good quality HEPA filter combined with a UV sterilizer offers the greatest spectrum of contaminant removal of any single portable air purifier, and accordingly is the most "complete" air purifier of its type currently available. UV light is extremely effective against bacteria and viruses and its efficacy has been widely proven and recognized by the scientific community. The biggest challenge for UV air purifiers is the air processing rate; we recommend a lower fan speed setting be used to ensure the maximum UV dosage (which is directly affected by the speed that the air passes through the system). Innovative manufacturers are using photocatalytic oxidation to further enhance the performance of UV sterilizers. Incinerators pass contaminated air through an extremely hot sterilization chamber where bacteria and viruses are killed by the elevated temperatures. These systems generally rely on passive convection to move the air, so they process air rather slowly. However, when used over extended periods as a means of bacteria and viral control, they have proven very effective. Since incinerator type air purifiers are not very effective at removing particulate and chemical contaminants, it is popular to use an incinerator-type air purifier in conjunction with a good quality HEPA filter. 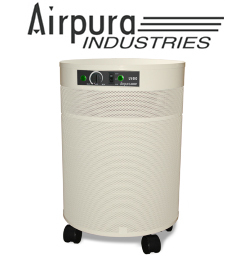 Our top choice is the Airpura P600 / P600+ which incorporates an excellent HEPA / activated carbon filtration system, a germicidal UV light sterilizer, and photocatalytic oxidation technologies. The P600 offers the widest spectrum of contaminant removal/reduction of any air purifier we offer. Of course, this level of performance comes at a cost. Not surprisingly, it is also the highest priced filter in the Airpura line-up. We also give very high marks to the Airpura UV600 and Airpura I-600 with UV Sterilizer, which are similar units but without the photocatalytic oxidation technology. On lower fan speed settings, the UV will provide good bacteria and virus abatement. At the same time, the unit contains an excellent HEPA and activated carbon filter for reduction of dust, chemicals, odors, and allergens.